How can I begin to describe the triumph that is Lyric’s Anna Bolena? Written in the Italian bel canto style, Gaetano Donizetti’s opera is exciting for its sheer athleticism—sky-high tessituras, gushing coloratura runs, and demand for superhuman vocal stamina. Soprano Sondra Radvanovsky heads a remarkably consistent cast that delivers musical thrills without skimping on drama, while Kevin Newbury’s sleek production offers illuminating psychological insight into Donizetti’s larger-than-life characters. Anna Bolena is a voluptuous fantasy on the death of Anne Boleyn, second wife to Henry VIII. The King (John Relyea) tires of Anne (Sondra Radvanovsky), having turned his attentions to her favorite lady-in-waiting, Jane Seymour (Jamie Barton). He seeks to annul their marriage by staging a conspiracy involving her former lover, Lord Richard Percy (Bryan Hymel) and a young page, Smeton (Kelly O’Connor). Anne is sentenced to death after a rigged trial—faced with her impending execution, she loses her wits in one of the most delicious “mad scenes” ever composed. 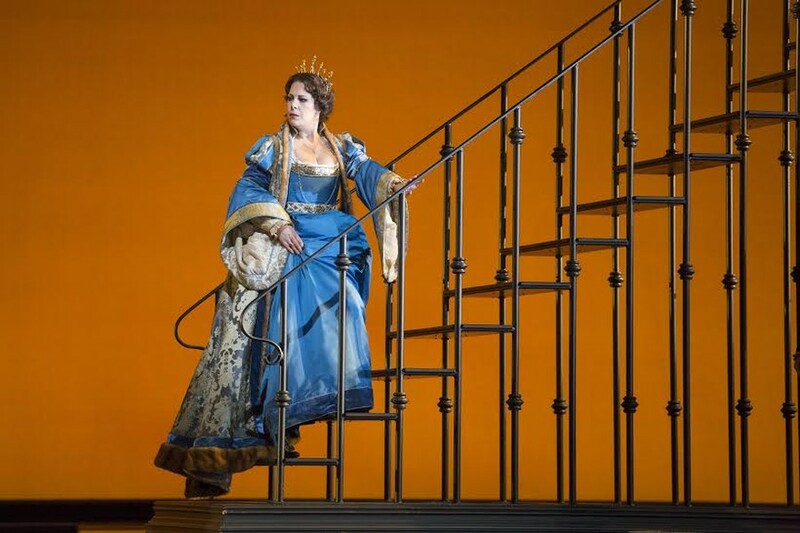 Sondra Radvanovsky dominates the production musically and dramatically as Queen Anne. Her stalwart soprano cuts through Donizetti’s lush ensembles and orchestration like a chainsaw through butter. Though rarely subtle, her high notes resound with tremendous power. She proves more intimate in duets, including the famous confrontation scene with Jane Seymour (“Dio, que mi vedi in core”), where her voice remains remarkably balanced and never overwhelming (although she seemed to forget one of her lines close to the end). Radvanovsky’s characterization, though, tends to lack nuance, as her anguish defaults to wringing her hands, or falling in a heap, or both. Yet her “mad scene” (“Al dolce guidami . . . Coppia iniqua”) is a dramatic triumph. Queen Anne—fearful, defiant, tormented Queen Anne—disappears. Radvanovsky is a shadow of what Anne Boleyn could have been, sweet and innocent and delicate with a sound to match. Restored to sanity in the cabaletta, her Queen Anne spits venom and cruel irony in her final moments. Though the quality of her high notes declines somewhat, Radvanovsky’s technique stays remarkably consistent through the finale, despite the role’s demanding tessitura and punishing length—almost three hours of continuous singing! King Henry becomes a villain the moment Donizetti casts him as a bass, and John Relyea’s booming, barking voice is all bite. He can be seductive, as in his duet with Seymour, but even then his dark, smoky tone betrays sinister intent. His attractive, angular features—topped with a bit of scruff—and imposing frame adds realism to the role, giving his character a testosterone boost. In a miracle of casting, Relyea’s bass proves a worthy rival to Radvanovsky’s cannon-like soprano, especially in choruses and ensembles: fittingly for the Act I finale, his brutal low notes pins down a sometimes hysterical soprano line. Tenor Bryan Hymel plays an ardent Lord Percy, his tone warm enough to heat Chiberia to a balmy 75 degrees. His high Cs, resplendent in color and breadth, elicited a chorus of bravos from the audience after each cabaletta. Vocally and physically, Hymel displays sensitivity opposite to Relyea’s swaggering Henry VIII—his soft, youthful looks lend cuddliness and romantic simplicity conducive to Percy’s devotion. Torn between her love of Henry and her devotion to the Queen, Jane Seymour is easily the opera’s most complex character. Jamie Barton deploys her luscious mezzo-soprano in a sensitive, engaging performance. Her sound is strong yet mellow, carrying Seymour’s ambition and guilt equally well. Though less vocally imposing than Radvanovsky’s incisive soprano or Relyea’s violent bass, Barton stands her ground in ensembles, carving out space for her uniquely honeyed high notes. The one blip in her characterization was Seymour’s suffering, especially in the second-act duet with Anne—the hand-wringing! The convulsions! I found it a tad overwrought, with all the despair of a vase shattering in slow motion. Among the supporting cast—which includes solid performances by tenors Richard Ollarsaba and John Irvin as Lord Rochford and Lord Hervey, respectively—Kelley O’Connor stands out as Smeton, the innocent page who sparks the scandal. Though compact, her arias prove memorable thanks to her smoky, attractive mezzo. Director Kevin Newbury’s production features a minimal set with detailed period costumes and descending pillars, and demarcates space well. I found the emptiness as an effective parallel to the experiences of Anna, and to a lesser extent, to the experiences of Henry and Percy: her broken marriage and fearful life at court, the result of futile ambition; his power as the King but unhappiness as a man; his love reciprocated but unattainable. Musically, conductor Patrick Summers deftly guides the Lyric Orchestra in an energetic, buoyant interpretation of Donizetti’s score. Though he provides good accompaniment to the singers, I felt that the choruses sounded somewhat chaotic and rhythmically uncertain. The brouhaha onstage during the Act I finale did little to help: toddler Elizabeth I running to Anna, then Henry dragging Elizabeth away, then Henry throwing Anna to the ground, then Henry straddling Anna while fake-choking her, and then a giant iron cut-out of a cross descending from the ceiling. Thankfully, the production posed few distractions elsewhere. My only complaint is that the Lyric waited to launch this glorious Anna Bolena so late in the season. Had it premiered in autumn, my tears would have remained liquid as I left the theater. An operatic Simone Biles, Shagimuratova delivered on the floor in Olympic fashion—equal parts art and power.